A meta-analysis found that the “best treatment” for prolonging PFS in R/R MM was daratumumab, lenalidomide, and dexamethasone. 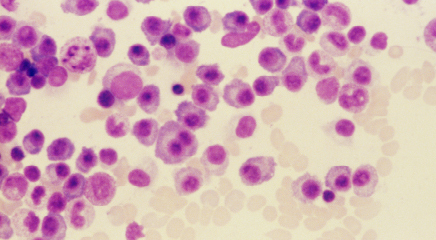 Since 2000 — after years in which dexamethasone and melphalan was standard treatment — clinicians now have numerous options for patients with relapsed and/or refractory multiple myeloma (R/R MM). These include the immunomodulatory agent, thalidomide, as well as bortezomib, the first proteasome inhibitor introduced in 2004, and 8 other treatments: lenalidomide, pomalidomide, carfilzomib, ixazomib, vorinostat, panobinostat, elotuzumab, and daratumumab. A systematic literature review identified 17 phase 3 randomized controlled trials including 18 treatment options. A network meta-analysis to evaluate the relative efficacy of each treatment found that the “best treatment” for prolonging progression-free survival (PFS) was daratumumab/lenalidomide/dexamethasone, with a hazard ratio (HR) 0.13 vs an HR of 1 for dexamethasone. The authors cautioned that data on adverse-event profiles and quality of life were not assessed, and that overall survival HRs for most of the trials are still immature.